Though the slave trade officially closed in 1808, an illegal trade continued on a small scale. 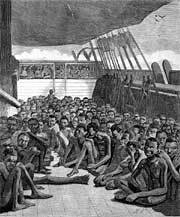 This image, "Africans on Board the Slave Bark Wildfire, April 30, 1860," depicted the condition of 450 Africans found on an illegal slave ship captured by an American steamer and brought to port at Key West. The engraving first appeared in Harper's Weekly, 1860 June 2. Library of Congress, Prints and Photographs Division, LC-USZ62-19607. Both Jackson's Christianity and his position in the public eye moderated his habits as a slave owner, but another factor was involved. Jackson lived through a time of great transition in the economics of slavery, which led to an amelioration of the physical condition and general health of slaves on Southern plantations. The signal event in this shift was the closing of the foreign slave trade in 1808. Prior to the closing of the trade, American slaveholders tended to work slaves with a definite life span in mind. In the early 1700s, in fact, slaves were expected to live no more than six or seven years, verifying Hobbes's dictum that life is nasty, brutish, and short. After the closing of the trade in 1808, the life of a slave remained nasty and brutish, but not so short. An illegal foreign trade remained active, but in general, slave owners could no longer rely on importing fresh recruits. Instead, they had to sustain the domestic population. As a result, it began to make economic sense to improve living conditions. Slavery continued to be a brutal institution, but slave owners began to favor conditions that led to the longevity of their work force. In this respect, Andrew Jackson probably served as a role model not just to beguile Northerners into tolerating the peculiar institution, but also to represent to Southerners the new approach to managing their slaves. Was Jackson a "model" slave owner?